ACTION ALERT FROM HEAL THE OCEAN-URGENT! To restrict ("ask only") on single use straws and plastic cutlery. Heal the Ocean asks you to please come to the City Council meeting, which begins at 2 p.m. to urge the Council to ban Styrofoam and restrict straws. Over 500,000 million straws are used (and discarded) every day in the U.S. Many big companies have banned single-use plastic straws outright: Starbucks, Ikea, Hyatt Hotels, American Airlines, Royal Caribbean Cruise Lines, Hilton, and other hotel chains. Click here to see the national recognition of the need to fight plastic pollution from straws – the harm to marine life from these plastics is well documented. The least Santa Barbara can do is implement an “ask only” ordinance. Statistics reveal “ask only” restrictions can reduce straw use by 80-90%; at least it’s a start! As for Styrofoam, it NEVER goes away, and sea animals ingest it. Please ask the Council to ban Styrofoam outright - no special conditions for companies claiming they need time to change. In the proposed Ordinance on Styrofoam, City Council should delete the “Exemptions” Clause 9.160.070. Other businesses across the nation, especially smoothie businesses, stopped using Styrofoam years ago and are now using compostable products that are superior to Styrofoam. In Hawaii, Lanikai Juice and Jamba Juice use PLA (plant-based Polylactic acid) compostable cold cups – made of corn starch and sugar cane which insulates both cold and hot drinks very well. 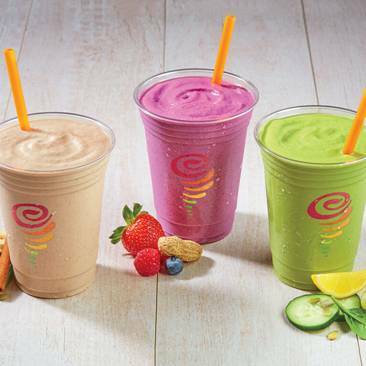 Jamba Juice smoothies in compostable plastic cups. Other smoothie companies that have stopped using Styrofoam cups include Robeks (since 2013) and Smoothie King, which switched to recyclable plastic cups in response to their customers’ request for more eco-friendly materials. The exemption clause in Santa Barbara’s proposed Styrofoam ordinance would allow one of the city’s most visible smoothie businesses to continue using Styrofoam, such that it would appear we would have an ordinance with no teeth. Also, we wouldn’t imagine that a major smoothie business would want to appear as an environmental pariah while everyone else has moved forward. Every voice and opinion matters, use yours to help end the plastic pollution epidemic on Tuesday, July 17, 2018. If you can't attend, click here to download a letter (we encourage you to personalize it!) you can copy and paste it in an email to the Council at SBCityCouncil@SantaBarbaraCA.gov. Please send by Monday, July 16, 2018.